Kurlee Belle: Did 'Desperate Housewives' Really just say that? Did 'Desperate Housewives' Really just say that? What happened to your hair? Is what Lynette (played by Felicity Huffman) asked Renee (played by Vanessa Williams) after Renee's hair was afro'ed out by her hair stylist. Renee who usually wears a straight look was very upset that her hair was less than straight and continued by covering it up with a scarf. Being a lover of Desperate Housewives since the premiere, I was baffled at this part of the story line that sends the message that black women should be ashamed of their natural roots. Although, I will not go as far as boycotting the show. It is puzzling to me that a station like ABC which seems to condone everything under sun would write such a story line in one of its most popular shows...........Renee's response to Lynette: "At least I can cover up this mess." ----which she did with the scarf. Great Post Kurlee Belle! You know, because I've learned to not take being natural too too seriously - I was eventually able to pick my jaw up off the floor and get to a point where I could actually laugh at those scenes where Renee sported an afro/curly wig...only because I get the context and comical style of the show and the characters in general. And to be fair - It wouldn't be the first time "Housewives" had an "oh-no-they-didn't" moment. For example, I'm pretty sure that Gabby & Carlos's portrayal of a "Latino Family" is an extreme portrayal and is probably offensive to some Latinos. Yet, there is always some truth in jest. And I have to admit that in those scenes, Vanessa William's character accurately portrayed some women who really view natural hair in that way. I think that I would be upset too, if I paid for a relaxer and ended up with an afro. I have worn my hair natural for over ten years and it was choice that I made. No one made it for me. I remember what relaxers cost ten years ago and I'm sure that the cost has increased. I also know from the experiences some of my friends have had by deciding to go natural. They all thought that their hair was going to be soft, curly and manageable and it was not the case. So they went back to the relaxer. I don't think we should give what was said that much weight. 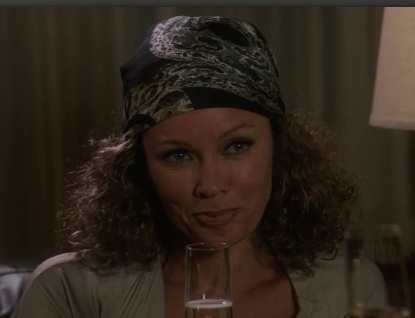 She is a black woman living on Wisteria Lane, after all. I think that "she" was ashamed of her hair. I don't think that the message was that all black women should be ashamed of their hair. I have been watching it for the last 3 seasons. I was shocked that they would do that too, but this is the last season for them too. This is amazing! You are obviously a well educated women. Wack choice by ABC. And yes it DOES send a message. Let's not kid ourselves. Almost every black woman has relaxed hair. Imagine Renee's tanning salon owner was upset and made her dark skinned as punishment. Would that be okay because, hey, it's just a joke? I doubt it simply because of how close to home it hits. We black women have true beauty issues when most feel ugly with the hair we were born with. I'm happy to see this second blog on this issue. And hey, continuity division. Er, the first wig is course, the second biracial curly. Add insult to injury. What is your Natural Hair Fashion Personality? Bed Head---Natural Hair Night time Regimen!